Biffy Clyro's drummer has given his reaction to X Factor winner Matt Cardle releasing a cover version of their hit Many of Horror. "The whole thing's a bit surreal," Ben Johnston told Australian radio station Undercover. "We think it's all quite funny," he added. Cardle is on course to reach number one on Sunday with his version, renamed When We Collide. According to the Official Charts Company, the track sold almost 170,000 copies in its first two days on sale, more than three times the sales of the second-placed single, What's My Name by Rihanna Ft Drake. It is thought Biffy Clyro's original version of the song, which reached number 20 in January, will also feature in the top 10. 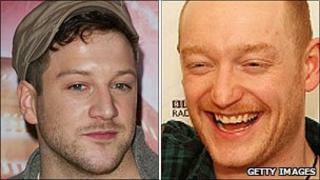 Cardle, who was crowned winner of the ITV talent show on Sunday, recently defended his version of the song. "It's a great song. I'm hoping that I've done it justice."